Search teams in the Bavarian town of Simbach am Inn found the bodies of three people who had been trapped in a house and a woman was found dead by a nearby stream. In central France an 86-year-old woman lost her life. Dozens of towns have been inundated and people have been saved by helicopter. Forecasters say waters are expected to keep rising for several days. The floods are thought to have caused substantial damage. 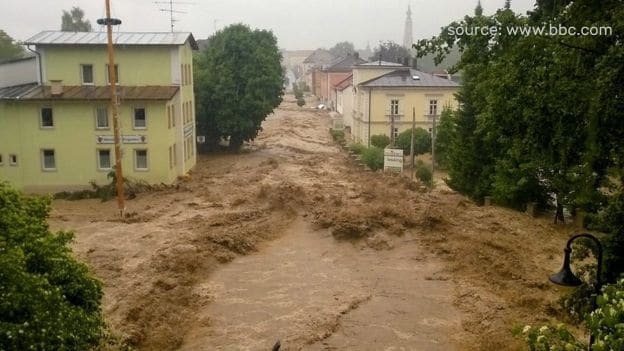 The worst affected area in southern Germany is the district of Rottal Inn, where a disaster centre has been established. In the town of Triftern, rivers and streams burst their banks. Floodwaters dragged along cars, trees and furniture from flooded homes. In many places the water reached several metres above street level. The inhabitants, surprised by the sudden flooding, had to be rescued by helicopter.